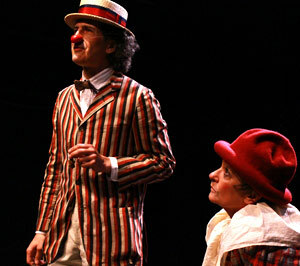 Toby Mulford is an educator, actor, musician, and playwright specializing in ensemble-created physical theater. He is the Managing Director of Faction of Fools Theatre Company, where he has performed in Romeo & Jluiet and A Commedia Christmas Carol, as well as directingThe Lady Becomes Him. 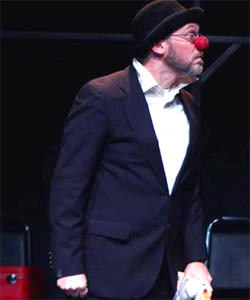 He is also the Associate Artistic Director of the Traveling Players Ensemble, where he started a five-week Commedia dell'Arte summer program for teenagers. He holds an MFA in ensemble-based physical theater from the Dell'Arte International School of Physical Theatre, where he co-created over a dozen original works. Other credits include Roundhouse Theatre, BigHeadHouse, the Vagabond Acting Troupe, the International Opera Company, and Tribe of Fools. 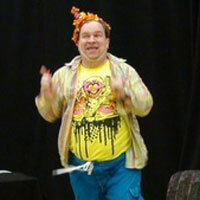 Karen Beriss, co-producer and emcee of this month's Clown Cabaret has been a professional magician for over 15 years. Performing at trade shows around the world, her magic and dry sense of humor - combined with corporate messaging skills - have captured the eyes of the press including National Public Radio, Market Place and The Wall Street Journal. She is super excited to have just joined the Big Apple Circus Clown Care program performing at Johns Hopkins in Baltimore. Karen is a regular at The Comedy Zone in Washington DC. She trained in improv and acting with Second City in New York. And she has performed for celebrities such as Johnny Depp, Kirstie Alley, Tom Daschle, John Kerry, the Washington Capitals and Robert Goulet. Most recently she worked with Leon Redbone. Plus, Karen's mom thinks Karen is funny – so it must be true.